Remote sensing equipment has revealed what appears to be a 100-foot-high room above Emperor Qin Shihuang's tomb near the ancient capital of Xi'an in Shaanxi province, the official Xinhua News Agency reported Sunday. The room has not been excavated. Diagrams of the chamber are based on data gathered over five years, starting in 2002, using radar and other remote sensing technologies, the news agency said. Archaeologist Liu Qingzhu of the Chinese Academy of Social Sciences was quoted as saying the room is unlike any ever found in a Chinese tomb. 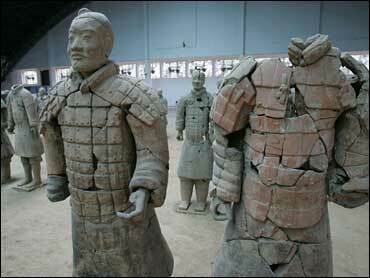 "Qin himself was very unusual, so it's not unexpected that his tomb should also be unique," Liu told the news agency. Archaeologists theorize that because the room was built on top of Qin's mausoleum and seems to have ladder-like steps leading up, it was intended as a passageway for his spirit, Xinhua said. Qin, who ruled from 221-210 B.C., is credited with starting construction of the Great Wall and commissioning an army of terra cotta soldiers to guard his tomb. Thousands of the terra cotta warriors were discovered more than 30 years ago by peasants from a local commune who were digging wells.